(Bloomberg) -- Walmart Inc. will offer reusable shopping totes at the checkout counters of all its U.S. stores for the first time as the world’s largest retailer starts to move away from the use of environmentally-unfriendly plastic bags. The company is rolling out ten new designs, each available for 98 cents, at the bagging stations of its 4,756 Walmart-branded stores. That’s more expensive than the previous version of reusable bags that it sold -- but those bags weren’t as eye-catching and had been scattered throughout the store. The retailer will still offer single-use plastics bags and the older reusable ones. The bags are part of a broader rollout of sustainable business initiatives that will be unveiled Wednesday morning at a conference at Walmart’s headquarters of Bentonville, Arkansas. A centerpiece of that effort is Walmart’s 2017 pledge to remove a billion metric tons of greenhouse gas emissions from its supply chain by 2030, equivalent to taking 211 million passenger vehicles off the road for a year. The company’s moves come as President Donald Trump has sought to dismantle Obama-era climate policies. Shoppers typically use plastic bags for just a short period, but the same bag can take up to 1,000 years to biodegrade. In response, Hawaii, California and New York have instituted state-wide plastic bag bans, while hundreds of other U.S. jurisdictions require surcharges for single-use plastic bags or mandatory in-store recycling. Walmart has seen “significant increases” in the sale of the new reusable bags in the locations where it pilot-tested them, a spokesman said. 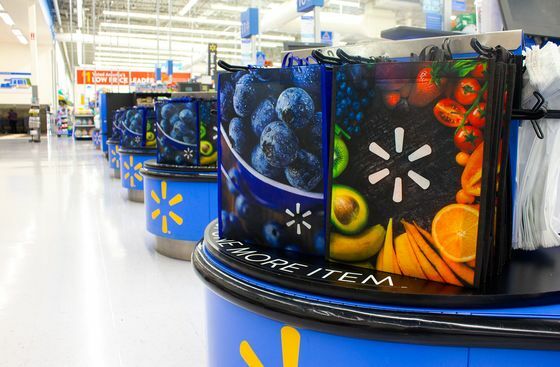 Walmart’s new bags will be made from recycled plastic. Reusable plastic bags made from recycled plastic have a lower environmental footprint than most single-use bags -- paper or plastic -- and only need to be reused four to 11 times to make up for their more intensive production process. Last year, Walmart shortened the length of its single-use plastic bags, resulting in a savings of $20 million per year. The company distributes as many as 20 billion single-use plastic bags annually in the U.S., according to Brandon Fletcher, an analyst at Sanford Bernstein & Co. Walmart declined to provide a figure.